On my last cruise I had pumpkin crepes with marscapone cheese in them OMG!! Best meal EVER!!! I need some Super Bowl ideas!! When I was still in college, my sister and I woke up craving crepes one morning. I looked at an online tutorial, and did the damn thing. It was SO easy. We may or may not have forgotten to adjust the recipe for 2 servings. We may or may not have also finished a jar of nutella between the two us since we didn’t have pretty fruity toppings like you. Mmm…. Paris has the best crepes ever. That’s where I had my first one. It was a savory one though! My mouth is watering for your fruit crepe right now though…. Yay for Barb! I can’t wait to give these guys a shot! Thanks for the how-to! I’ve tried making protein crepes before and they didn’t work out too well. I’m a bad flipper! LOVE crepes…who doesn’t, lol. Fave combo is nutella and banana. I am going to try this, but I think I’ll fill mine with pulled pork and top them with bbq sauce. I have never made crepes before! I am super type A too and have always been too nervous to even try. They look so pretty…I may just have to cave! Thanks for the how to…VERY helpful! 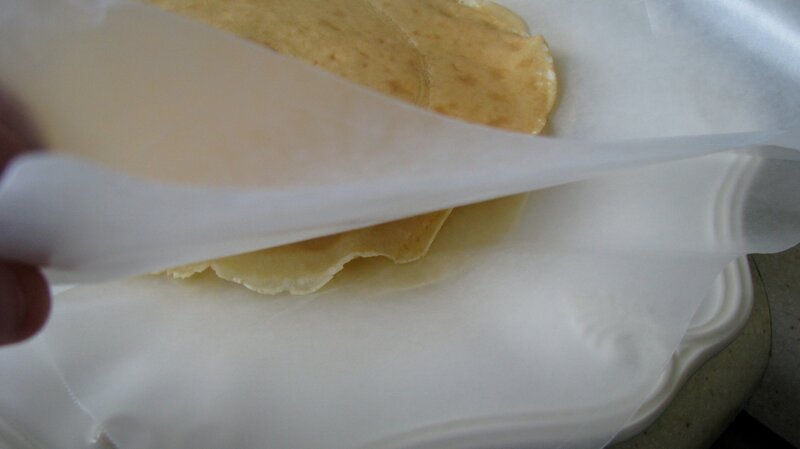 I have always been intimidated by crepe making, but you make it look so easy, I am going to have to give it a try. They look delicious with berries! Yum, crepes! I love the endless possibilities! Fruit is always a great topping! Oh that’s awesome…crepes have always been something I have been intimidated by. They just seem hard…. Woot for making crepes without a crepe pan! I need a sifter, however…. Thanks for the recipe, girl! The look wonderful! I will be making these!! Thank you so much!! This was a waste of a comment, wasn’t it? Thanks for the review. I know I can do it cause I got an A on them in college. Yes, I was assigned crepes in cooking class and they turned out good enough for me to get an A. I haven’t made them since, but I will be doing this soon. I haven’t had crepes since middle school! A horrid teacher ruined them for me! I LOVE this idea! I’ve never even thought about making crepes before, because they sound complicated, but this looks super easy. I don’t even know if I’ve HAD crepes before! Thanks for the recipe! ahh thanks for this jess! I’m scared to make crepes! This makes me feel a little better about it! I never made pancakes, never even tasted them (well yeah these are not really something on a regular Lebanese menu) yet I work crepes like a wizard and without a crepes pan. Although I have those cute small pans that give out the cutest 10cm (around 4″ I think) in diameter crepes. I think they are one of the best things to make and they can be very versatile: you can fill them with pretty much anything! you must have one with Nutella in the middle! oh my… it’s one of my favorite indulgences when I go to Germany! Surely it cannot be that easy! I am in disbelief. i’ve been waiting for you to post this recipe! it looks so yummy and doughy. I don’t own a crepe pan and have been WAY too intimidated to try and make them on my own but you make it sound so do-able! Thanks! Awesome recipe! I can’t be trusted around flippy foods and have stolen my mom’s crepe maker device. It’s fabulous…once you add nutella and all the fruit! I actually haven’t ever had crepes either. I like my little food box and rarely like to try new things. What do they taste like? I grew up eating crepes as one of the only “treats” my mom made regularly. Somehow, the fact that it was French justified the amounts of Nutella we’d slather onto them. I still haven’t perfected the flip, but they’re so good! Thanks for the recipe! K, I shoulda read this before making mine this weekend. Seriously.. we had such a freaking mess in my kitchen. Wax paper will be used next time!!! i can TOTALLY make this! i loves it! these look SO good – i wish I could sneak blogging at work..I have to wait till I get home. Maybe I should start cooking with my students and then I can blog and work at the same time! Merci beaucoup for the step by step! I don’t own (nor want to buy) a crepe pan and have always avoided trying crepe recipes for that reason. 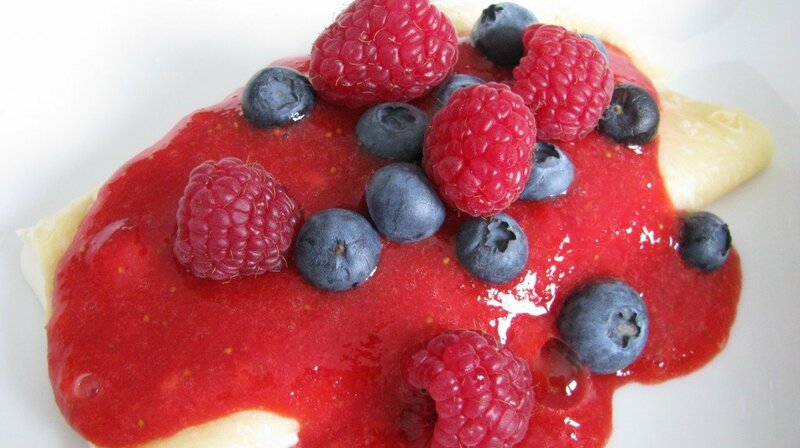 I sence dairy-free crepes coming up this weekend!! Would you omit the sugar if you’re making savory crepes or keep it for structure? I love crepes! They are so awesome! I need to make some! ahh thank your for this recipe!! I have always wondered how to make crepes without them turning into pancakes :) delicious! this is sucha useful post- im going to try this when i’m home bc i’m certain we don’t have a crepe pan!! OOO! I think I’m going to do this for a saturday breakfast!! Yummy! I can’t do an omelet either..you should learn, and then share. I have made crepes a few times, and I LOVE them!! I make Mexican ones with pibil pork and cheese inside topped with a poblano pepper sauce! They are to-die-for! These look fantastic! I’ve never made crepes at home before and was actually talking with my hair dresser about them the other weekend – she tops them with Nutella (dreamy…?) I need to get on this crepe thing soon, thanks for the directions on how to make! Mine are big, too. A dehydrator, Vita and a Blendtec, a juicer, spiralizer. We own diff stuff but it’s still the same: stuff! And yes, soooo many oats on blogs. I prefer crepes. Or Chocolate! Love that you went for it here! These would provoke anxiety in me as well. Being such a control freak, it would bug me if I didn’t get the perfect “flip!” If you say crepes are do able then I might need to give them a try. I’ve always wanted to make crepes…you make it look so easy, although I’m sure I would end up with mushy dough. the crepe looks really good. I had always want to make it myself but end up with pancakes!! Thanks for this post. I thought crepes would be a lot more fattening, but they don’t seem to be that bad for you according to the ingredients list .